What if space shifted and time bent and we could meet ourselves as we’ll be twenty years from now? What if we could talk face-to-face with the people we were in the past, with the people we are in the parallel lifetimes, in alternate worlds? What would we tell them, and what would we ask? How would we change if we knew what waits beyond space and time? Heavy? Don’t worry, I’ll lighten everything up. The last time I wrote was when I fell in love … … with ‘a book’ … … and that too of philosophy of Plato. And my friend Mols, he wrote recently to me, saying so. My falling in and out of love is a story that stretches far back in time. I fell in love couple of times and (luckily) fallen out of it till I found Gitanjali. Anyway, flashback. I recall one incident on the time-line during which my heart would skip a beat on seeing her. She was (and is) somewhat of a whizz-kid. Did I hear someone mention a name that sounded like some classical music composer of olden times whom my friend Misha would very often impress upon me to listen? And what the hell was this Richard Bach doing in my private and personal love story? Well, he was there. No way out of it and no denying of it. Richard Bach. The lines in the beginning of this piece are by him. Lets skip some details of how I got to know her and all the stuff I did to make her notice me which she did, we’ll go directly to one incident of me with her. So flash-forward a little. I was sitting with her at her place, and we started talking about books (Oh my God! Save me.). I became an avid reader after that encounter, but at that time I would say I was … not a great reader and was likely not very comfortable discussing about them books. But anything for her. “Do you read?”, she asked. What a question. Of course I read. I did my schooling in a British Convent School, and yes ma’am I do read. “What do you prefer in fiction?”, now wait a minute, what is fiction … … my mind was running its horses; fiction … fiction … yes – stories. “I prefer pulp.” In my mind I silently thanked Quentin Tarantino for making Pulp Fiction. If many of you have not guessed, I’m a movie-buff too. That was the first time in my life I heard about Richard Bach. Who was this Bach. Misha would often come to my hostel and put Johanne Sebastian Bach’s compositions at very high volume … boring the hell out of all of us. But same man cannot be a philosophical or meaningful writer and a great composer at the same time (or could be, you never know). Richard must be someone else. “Yeah.” I was trying to be ecstatic, “Richard Bach. O my God! You should have told me; rather we should have talked about him earlier. Do you know my father reads a lot and Richard Bach is one of his favorite authors? Do you know that he has all of his famous books? I think 5 or 6 of them. But personally I would have skipped though 1 or 2, but his writing do not impress me much. Actually, I am more practical, so I prefer staying away from all that needs brains.” I was trying everything to win her. Now that I have made an easy way out of all the discussions that I could have gotten myself into, I’ll tell you about my father. Well he reads a lot … he reads jokes, newspapers and his immense collection of advanced calculus books. If you would ask him, he would say who is Richard Bach. He is all logic and no philosophy. He doesn’t even know if a man with such a name ever existed. 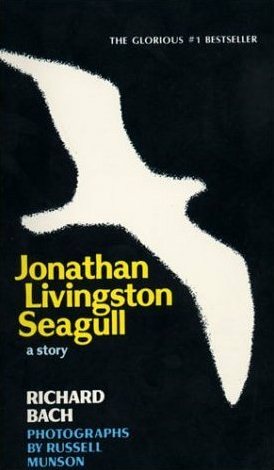 Jonathon Livingstone Seagull? Now what is this? Must be some seagull. “Oh yeah, it’s different. Unlike many stories we read in our day to day lives.” This is the most appropriate answer. For those articulate people who are very good in discussion, I think they would understand that at this point I must give discussion a new turn. “I read it long time back. So I never perceived it like that. Would you like to read it? I can get it to you.” Let’s get out of this seagull business, I was thinking myself. “Can you?” there was twinkle in the eye and a beautiful smile on the face. I could have done anything at that time. “Oh thank you, Sonu. That’s so nice of you”. Oh yes, I am nice. And henceforth this man … … what’s his name – Richard Bach came to my life. Well I stayed for some time and had some pakoras (fried fritters) with her while I was being given this dhobi patkaa about Richard Bach. Before taking leave, I promised her that next time I’ll go to Amritsar, I’ll get all of Bachs. It was 4’o clock in the afternoon when I left her place and it was Thursday. On my way back, I stopped in Sector 17 at Capital Book Depot. My friend Ajay’s dad is the owner of that shop (he became my friend after this Bach). I went to him and asked for Bach … Richard Bach. He looked at me from head to toe (“Don’t I look like one of those Richard Bach guys?”). He showed me to the shelf and I could see was a rack in front of me with all the Bach. He suggested Kahlil Gibran, if I was about to start with this kind of writings but I told him that I’d buy only Bach. He went away and I counted that six of the titles of this author were lying there. I brought all the six of them on the counter and asked Ajay for the price of all. He said they’d all cost me around Rs 800. And I had none in my pocket. I told him that I have no money with me but I would like to buy all of these tomorrow and he can keep a set aside for me. He said that would be no problem at all and that I can come anytime to buy them. Now to arrange 800 Rupees. In the evening, my parents called (they used to call me everyday, even today they call me almost everyday) and I told them that I was out of money and needed to pay some hostel dues and I also need to buy few books. My father never questioned me about money. He said that I can collect the money from the driver of a local bus service (Maharaja Travels) that runs between Amritsar and Chandigarh. Wonderful. The very next day around half past 10, I got the money. Two thousand rupees. Hit Capital Book Depot. Ajay recognized me, I think it was easy for him since I was wearing the same clothes that I was wearing the day before. He was surprised that I have come back for Bach. Many people do not turn out after they have asked the bookseller to keep some books aside for them. I bought the books, made the payments. That’s when Ajay and me came to know each other. I have bought many books after that from him. Over the weekend, I read Jonathan Livingston Seagull, One, There’s No Such Place As Far Away. So now I knew who is Richard Bach. Then I started with Illusions: The Adventures of a Reluctant Messiah and then later after 3 days I started with Biplane. Well I was through with five of his books. And then the one that remained was The Bridge Across Forever: A Love Story. On Friday Misha came. Misha’s eyes twinkled at the sight of these books. He saw all the books lying scattered in my room. His expression was of a clown who gets struck by a baseball (or cricket) bat and passes out with the smug happy expression on his face. “Sardarji, theek thaak ho (surdy, are you alright)?” was his instant question. After much dodging around, I ended up telling him the truth. Now it was easy to talk to him. Needless to say, Misha had read almost all the books. We had a nice discussion. “After reading the book, one thing has become pretty clear in my mind. we are not here for mere earning our bread and butter. Life is all about exploring new heights, think about them till you reel under the pressure, dream about them and nurture them.” I repeated what she had said to me. I was impressed. Misha, the great. Now I can talk about this author. “This book packs into a few short pages a plethora of universal truths. It is a simply written tale of the nature of purpose and of perfection. It’s a story of freedom and thought and immortality that ought to inspire even the most stubborn pessimists and nay-sayers.”, I added as now I understood it better. Misha made himself comfortable in my room (as he always used to do). Many ideas were exchanged over lunch and over evening tea. Misha wore the same smug expression and was also enjoying every moment of it. “Yes, exactly. Very true, very true”, Misha said sipping his tea. Misha left for home later in the evening. That night, I finished Biplane. It was first time in my life I felt there is more than Sidney Sheldon to life. There is Richard Bach. Oh what a writer. I was doing it all because of her. Did you guys think I forgot her, talking about Misha and Richard Bach? Of course not. And all these days, I must tell you, I was meeting her everyday and we talked and chatted a bit – but not Richard Bach. During the next weekend I finished with The Bridge Across Forever: A Love Story. Bach wrote of a man haunted by the ghost of a wise, mystical, lovely lady who lived just around the corner in time. This story tells of his quest to find her. His search for his dreamed-of soulmate, his detour into wealth and success, and his ultimate meeting with the woman with whom he has found love and enchantment. If you’ve ever felt alone in a world of strangers, missing someone you’ve never met, you’ll find a message from your love in this book. Isn’t it amazing how our life is so in our faces yet we are too blind to see? This reconnects to the hummings from my inner self and not the moaning of the outside world. When we are finally at one, awake, and aware who knows maybe we can all have it. We get the answers all the time but we push them away for whatever reason. An inspiration to love beyond this life. Well, I had read it all and was ready to talk to anyone about this author. All this to get the attention of that someone special. Over the next weekend, I went to Amritsar to meet my parents. Spent some time with them. Met couple of friends. Missed her. Traveled back to Chandigarh. On Monday, I met her. After daily greetings, I told her that I had brought the books she wanted. She was happy to know that and seeing her happy, I was happy too. That evening I took the books to her place and gave it to her. And even suggested the one’s she should read first and the one’s that are to be savored last. She read them in about 10-12 days time. I had continued to meet her wherever I could and even discussed the books individully with her (thanks to Misha). She was happy to know that I had read them all. She was impressed by my versions and understanding of these writings (I think). Afterwards, she suggested many more books to me and many more she demanded (the one’s she wanted to read and Ajay happily supplied me with them (of course not free). And that how I came to know about Richard Bach. As I write this, I see that set of books in front of me. As I look back, sometimes I think I was making a fool of myself, and at other times, I think that she has to be thanked at some point for making me a more ferocious reader. I have read hundreds of books since, needless to say even more heavier than Richard Bach. But these books have a special place in the time line of my life. It was fate, destiny or her, but in the end, she did make a difference in my life, and my reading. Wherever she is in the world, I hope she is reading some new book, or maybe she is reading the ‘life’ itself. Epilogue (August 2010): Although my original Richard Bach books are scattered everywhere, my new set of Richard Bach still sits on my bookshelf, as seen in one of the images above.